One day @ a time: Blessing in disguise.. I never had qualms in accepting that everything happens for somebody's good; just that I was not this 'somebody'. I always used to be one of the 'other bodies' who would be rubbed on the wrong side to benefit this 'somebody'. But the other day, as Jupiter aligned itself firmly between Saturn and Mars, the 'other-body' and 'somebody' became one; that's me. I found myself sitting beside this twenty-something cute girl in the bus, on my way home. She had an air of nervousness around her and she was clutching a handbag so tightly as if she is carrying state secrets inside it. Apart from the moisturizer, sun screen, lipsticks, foundation cream, mascara, lip-glow, eye liner, tissues, nail polish, deodorant, perfume, combs, hair bands, mirror and a family photo of Jesus or Krishna, I couldn't think of anything valuable inside a lady's hand bag. I tried talking to her but hearing her monosyllabic answers, turned the other way and put the earplugs firmly into my ears. Frank Loyd and Idris Muhammad were playing 'The House of the rising sun", and I prefer it any day to an indifferent female. A few hours went past without anything happening inside the bus, except for an occasional coughing or sneezing. Then my friend called to talk about the awesome organic farm he visited during the day. As we were talking, I noticed the young lady getting up and talking to someone in the upper berth. The bus had semi-sleeper seats on the lower berth and sleeper seats on the upper berth. By the time I was done with the call, she left the seat beside me and climbed on to the upper berth. She never came back. I am not sure whether my discussion on composting and bio-gas had actually irritated her. But my fellow passengers had already reached their own conclusions and started staring at me like I have done something terrible. Can't probably blame them either.. why should a girl suddenly get up from her seat and move to another, if not for some improper behavior from my side.. right? For the first few minutes I enjoyed the attention, as people from all the seats around started noticing me.. with that "I know what happened" look in their eyes. There was a mom-daughter duo seated right in front of me and I saw the mother asking her kid to straighten the seat, lest she might fall on my lap by accident! She then turned around and looked at me with suspicion written all over her face. At first I ignored her, but when she turned around for the seventeenth time in two minutes, I squeezed a smile on to my face and waved at her. I was ready to wink at her in case she turns back again; but she had made up her mind by then that I am indeed dangerous. The stares stopped gradually as I generously offered smiles in return. I had the entire two seats for the night. Also some extra space in the front as the mom-daughter duo decided to sit straight and sleep through the night. 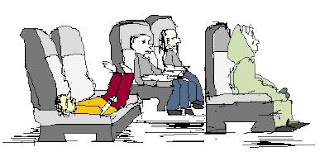 I raised my legs up on to one seat, stretched my body fully, and had the sleep of my life, while my co-passengers twisted and turned to get into the comfort zone. The girl had also left half a bottle of orange juice on her seat.. and it was a really hot night! Fending off the sarcastic stares from your co-passengers - Hard. Waving and smiling at the aunty who stares at you - Dangerous. Getting an empty seat and extra leg room in the bus, without paying or fighting for it - Priceless! good. you have company. Come and share in our Anthem... Yeh zamein hai.. aasman hai... aur beech mein hai hum.. mare- mare, hai re - hai re. yes.. Probably we are wired to retain more vivid memories of pain than pleasure !